Did someone say “foodball”? Because that is what I heard. I’m quite sure they probably said “football” however my brain translates it automatically. The only time I watch football is either when it is playing on the TV at a local pub or at a friend’s home. Either way food is involved. Game day nibbles are oh so good. Rosemary White Bean Dip is a tasty appetizer to munch on while watching a game. A certain big football game is coming soon. It’s the season-ending one where the champion team is determined. That is not new or breaking news. It is only funny because if it were not for the food I would have no idea of when it occurs. I can’t even tell you which teams are playing in it. What I can tell you is I’ll be there for the festivities. I’ll be chowing while everyone is cheering. 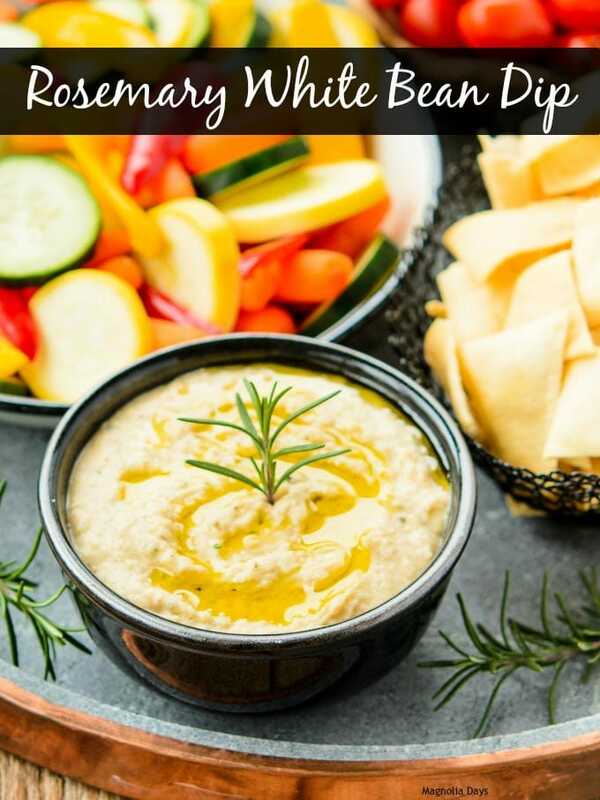 Rosemary White Bean Dip is an easy to make and healthy appetizer. Yea, I know, game day food typically has more of a splurge aspect. We all need a balance though. All you need to make it is a food processor. Put it all in the bowl, process it, and you are done. It is best when made a few hours before serving. I also strongly recommend using good quality extra virgin olive oil since it is used both in the dip and drizzled on top. There is no sense in having a flavorless light oil as a garnish. How does the dip taste? Cannellini beans (aka white kidney beans) are the base. They are quite bland and heavy on their own. Citrus lightens them up. Rosemary adds freshness. Garlic accents and gives its wonderful flavor punch. The texture is similar to hummus. Actually this dip could be made into hummus by adding in tahini. 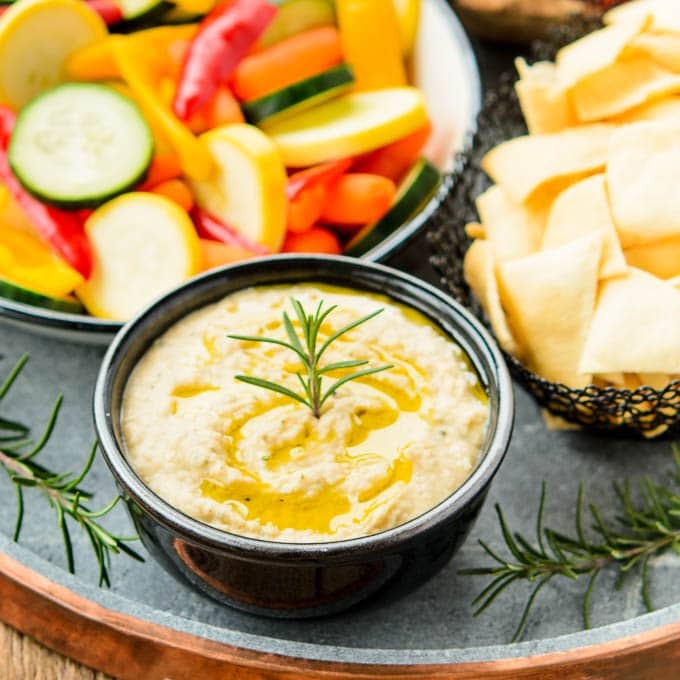 Serve the dip with an assortment of crudités, pita chips, or crackers. Game day food needs beverages to go with them. I paired the dip with Gallo Family Vineyards Sauvignon Blanc and Cabernet Sauvignon. The citrus flavors in the Sauvignon Blanc matched up with fresh lemon juice in the dip. Rosemary is an intense flavored herb that stands up to a full-bodied red wine such as the Cabernet. Are you getting ready for the big game? 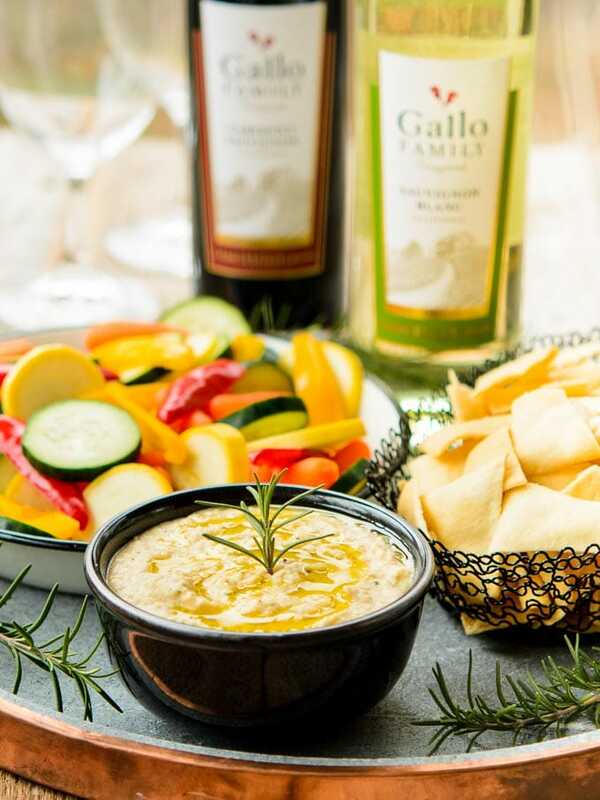 Sunday Supper is proud to partner with Gallo Family Vineyards to share winning “Supper Bowl” appetizer recipes and wine pairings. Scroll down to see what my fellow Sunday Supper contributors are bringing to our virtual big game event. Also look at Gallo’s football finger foods, tips for hosting the big game, and game day entertaining & pairings. Make Cherry Cream Cheese Bites for a crowd-pleasing dessert. Recipe adapted from Cottage Living magazine June 2008 edition. I love that you added rosemary to the White Bean Dip. This looks delicious and healthy. I may be making this for the big game! I would go to town on a bowl of this dip! I bet it would be great with zucchini! What a wonderful combination. White beans and rosemary. Genius. I love, love this healthier dip option! And the garlic and rosemary make it swoon worthy in my book!!! I’d be happy to use any leftovers as a sandwich spread! I look at your photo and the first thing I think of is grabbing some pita chips and start dipping. I love this recipe! I love white bean dips, and this one looks like a delicious and flavorful choice for snacking or celebrating! Haha, “foodball” is a great name for it, Renee! I love everything about this dip! 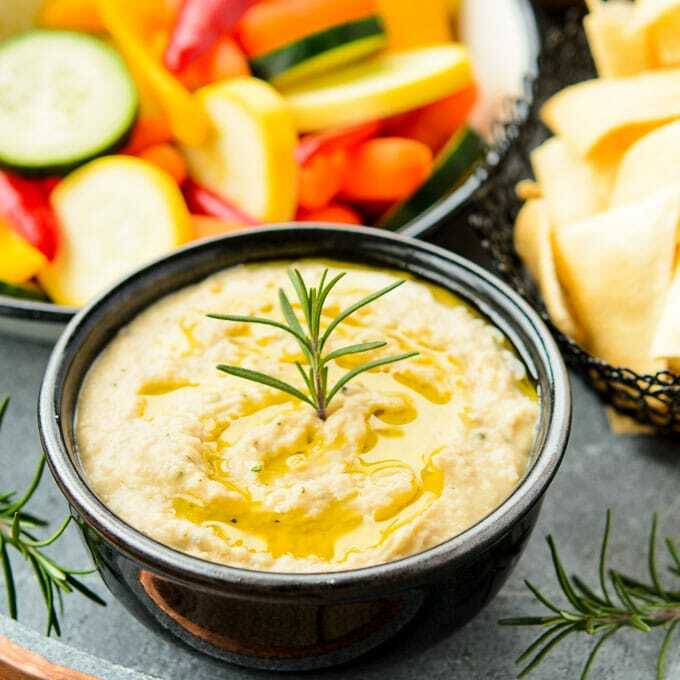 Renee, this rosemary white bean dip is full of flavors and I’m loving it already! Rosemary and cannelinu just go hand in hand for me. Much like this wine and the dip! Yum! Yum! I love white bean dip!! I have beans in the cupboard, and a rosemary bush outside, so I think I see this dip in my near future! I need a stronger word than LOVE to express how much I like this recipe. I’m making this ASAP. Yum times a ziiiiillllliion!!!! I absolutely love the sound of this dip! Hummus is a perfect game day snack. This is my kind of dip to have at a party (or any time really!) Love the addition of rosemary! I love making white bean dips, and mmm, the rosemary in here sounds wonderful! I’ve been looking for a new bean dip and I love the addition o rosemary in yours! Um – I need this dip in my life. Immediately!!!! Now I’m wondering how many times I’ve accidentally typed “foodball” instead of football. Because it’s so true – this sport really is all about the food. Lovely recipe, Renee! I LOVE white bean dip but I’ve never seen any as beautiful as yours! I will have to add that to my menu tomorrow. I’m already making your “devil wing sauce” for tomorrow. we’ve had it several times since Halloween and it is wonderful!